A $1 million makeover will restore the Goat Island Light Station to mid-century form -- running water included. 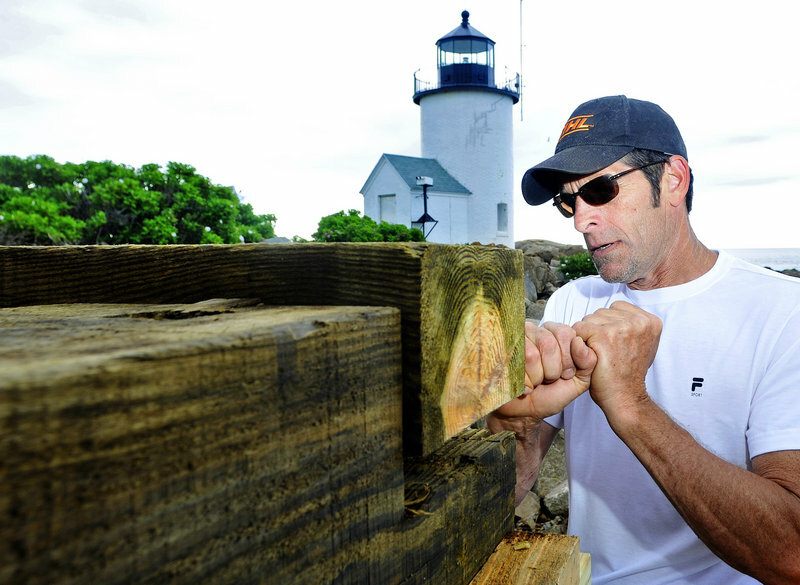 CAPE PORPOISE – After five years of obtaining permits and fundraising by the Kennebunkport Conservation Trust, work is finally under way to restore the Goat Island Light Station. The $1 million project, expected to be complete by September, will give the island a circa-1950s makeover. 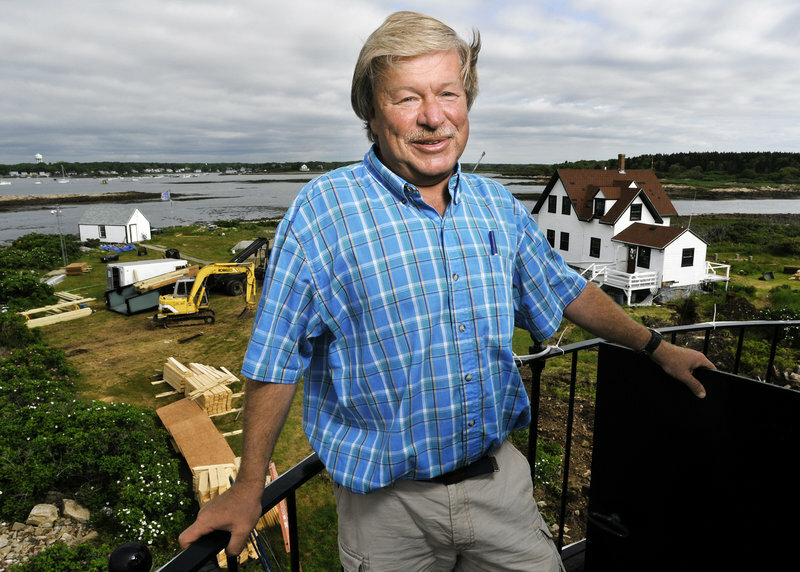 Scott Dombrowski stands atop the lighthouse on Goat Island, where he has been caretaker for 19 years. After the station renovation is completed in September, a $2 million endowment will be created to preserve the site for future generations. The project will include rebuilding the bell tower, a fuel storage building and a covered walkway connecting the lightkeeper’s house to the lighthouse. The trust has owned and managed the lighthouse since 1998. Longtime caretaker Scott Dombrowski pointed out the old walkway and bell tower in a framed photograph hanging above the couch in the living room of the lightkeeper’s house. Other photographs in the room show the island and the lighthouse over the years. Those photographs are playing a role in the renovation. “We’re copying the pictures to get historical accuracy,” said Dombrowski, who along with his wife, Karen, have been the caretakers for 19 years. The couple lives on the island during the summer, and Dombrowski checks the island periodically during the rest of the year. He said that restoring it to the 1950s was somewhat selfish on his part — there was running water and electricity on the island then. But Mike Weston, who is treasurer of the trust’s board of directors and is helping with the restoration, said that wasn’t the only reason the trust chose that decade. “We have a lot of photo evidence that shows the bell tower and walkway,” he said. The trust has worked extensively with the Maine Historic Preservation Commission throughout the process to ensure that its plans meet historical standards, Weston said. 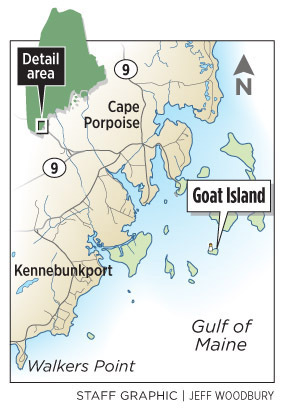 They also needed permitting and approval from the Department of Environmental Protection, the Department of Inland Fisheries and Wildlife and the town of Kennebunkport. Susan Edwards, executive director of the Kennebunkport Historical Society, noted the island’s historical importance and said she is happy to see the restoration under way. The lighthouse has guided mariners into the narrow, sheltered harbor of Cape Porpoise since 1833. “It’s fabulous that the trust has had the foresight to do this. It’s important for the community and coastal heritage,” Edwards said. The renovation effort is visible from the mainland, including landing craft carrying over heavy equipment and materials. On Friday, contractors worked on the steel frame of the bell tower. Weston said the new tower is designed to withstand high winds, but will look exactly like the tower that was torn down in the 1960s — including the bell itself. Edwards said the historical society’s board voted recently to return the tower’s bell, which has been in front of the Town House School on North Street, to the island on a long-term lease. Alan Bartlett of Bartlett Builders is subcontracting the project with Chesterfield Associates, a marine contractor that has experience with lighthouse projects and provided the landing craft and heavy equipment. Once the restoration project is complete, Dombrowski said, the next step will be creating a $2 million endowment for the property.